and has become very popular amongst the participants in the Debt Collection industry. The Convention has confirmed that it has become the annual event of choice within the debt recovery- and credit management industries where lawyers and debt recovery specialists can meet and network with the Executive team members of the most sought-after creditors in South Africa. It is also regarded as the de facto platform for credit managers, lawyers and debt recovery specialists to update themselves with the latest trends in our industry; and to verify that the systems and solutions used in the South Africa comply with all relevant legislation, and meets the ever-increasing need for performance-driven debt collection. The FutureSoft Debt Collection Convention has become the annual event of choice within the debt recovery, legal and credit management industries. Our 8th Annual Debt Collection Convention was held on the 14th of September 2017 at Emperor’s Palace, next to OR Tambo airport. 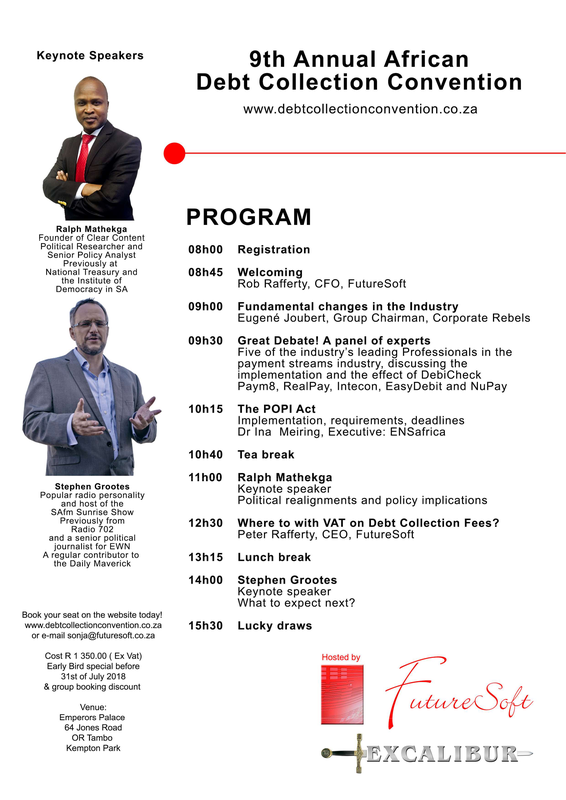 The aim was to introduce the latest technologies and developments available to the Corporates, Attorneys and Debt Collectors and to discuss the challenges each participant in the Debt Collection Industry faces. 2017 was even bigger and better than previous years, with 423 delegates that included attendees from all over Africa in the corporate, legal and debt collection industries, and to keep our delegates updated there were 24 Exhibitors focusing on communication solutions, payment solutions and other specialised solutions directed to assist debt collection firms and law firms, and corporates owners and management. The attendees included various executives from Banks, Retail Stores, Corporates, Municipalities, Law Firms, Debt Recovery Agencies, and such like. It was supported by ADRA, the Council for Debt Collectors and the Law Society of South Africa. The first key-note speaker was Bruce Whitfield, the host of The Money Show on Talk Radio 702 and Cape Talk. He spoke on the state of the economy and highlighted certain predictions for the near future. The second key-note speaker was Justice Malala, a political analyst and author, and the host of the Justice Factor on eNCA . Justice had a profound message on the country’s leadership and his predictions on the near future. 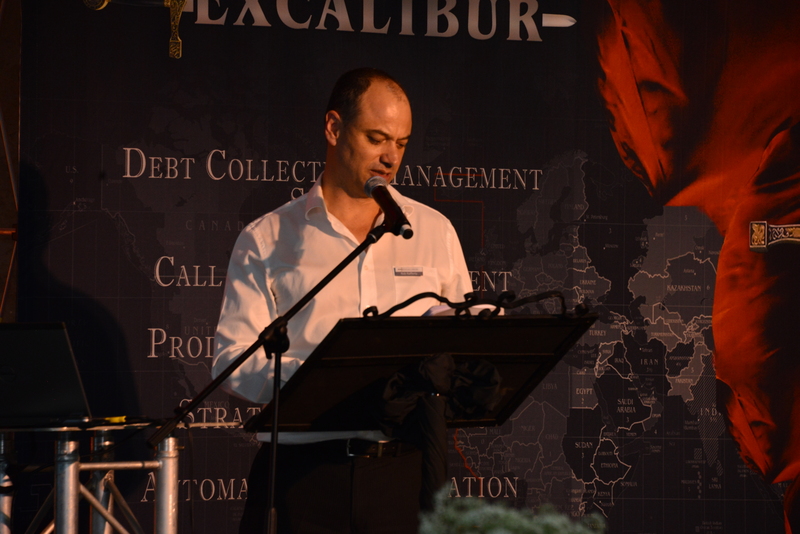 Furthermore the following expert’s in the Debt Collection Industry also presented: Mr Andries Cornelius, the Chief Executive of the Council for Debt Collectors, discussing the latest industry developments. We then had a panel discussion regarding optimization of a debt collection company, facilitated by Marius Smith, the President of ADRA and COO of the Nimble Group. Mr Evert Smith, a security analyst, presented the different security risks to your company’s networks and disaster recovery. Mr Peter Rafferty CEO of Futuresoft, also presented. His presentation focused on legal compliancy of legal software in South Africa. The day ended with Frans Haupt, the Director of the UP Law Clinic. His topic was the NCA vs. Common Law vs. DCA Bill. We are proud to announce the details of the 2018 Debt Collection Convention. Want to join the Convention? [DEBT COLLECTION CONVENTIONS] Copyright © 2010 - 2017. All rights reserved.